inspired by the tradition of oral story-telling, theatre Y presents the “the itsY bitsY series”, dramatized performances featuring outstanding writing from around the world. sweeping across all genres of writing, the itsY bitsY series aims to introduce the public to selected writing from celebrated writers and also serves as a platform to encourage original writing. itsY bitsY helps you experience the joy of stories, explore the wondrous variety of writers, genres, languages, forms, performance, spaces and audiences. the performances will showcase and celebrate an eclectic mix of stories, plays, poems, speeches, essays, blogs, flash fiction and so on, in order to celebrate the written word. the aim of the series is to introduce people to literature of all kinds, to celebrate writing in all its forms. we aim to organically build a platform of actors, writers and performers by taking literature to the people, by performing at various places around the city. by performing the pieces, theatre Y aims to move from page to stage and encourage and inspire people to read more. a typical itsY bitsY event will be a potpourri of readings and/ or performances with the spotlight being on the story and the actor. celebrating a variety of thought and expression, with itsY bitsY, you never know what’s in store…. theatre Y invites you to come and explore…. you never know what’s in store! 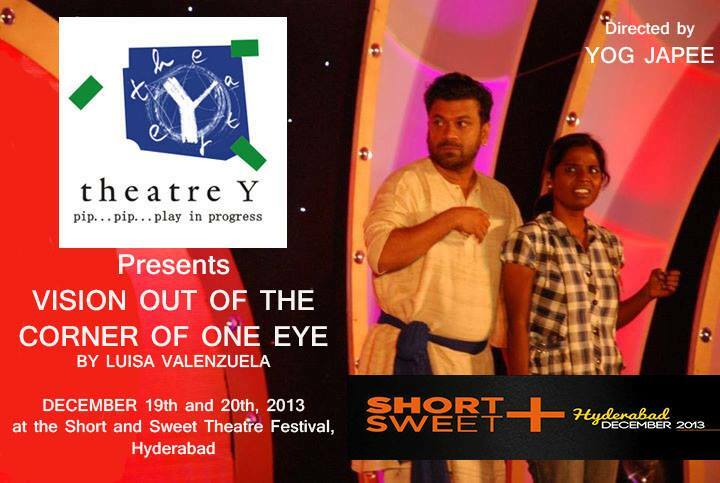 theatre Y performed at the short and sweet festival, hyderabad in december 2013! we performed luisa valenzuela's "vision out of the corner of one eye". originally a short story by argentinian writer luisa valenzuela, the piece has been translated from the spanish. the piece was enacted after extensive improvisations and has been performed by four different actors in two languages, english and tamil, and is part of theatre Y’s “the itsY bitsY Series”, dramatized performances featuring outstanding writing from around the world. luisa valenzuela (born November 26, 1938, in buenos aires, argentina) is a post-'boom' novelist and short story writer. her writing is characterized by an experimental, avant-garde style which questions hierarchical social structures from a feminist perspective. she is best known for her work written in response to the dictatorship of the 1970s in argentina. performed by kalieswari s. and rohit kumar. directed by yog japee. Special guest appearance at the finals on July 21st! "paapa" is a piece performed by krishna ganapathy, using only mime, sound and gibberish. it is a hilarious interpretation of a man driving his pregnant wife to the hospital. "paapa" won three prizes at the short and sweet theatre festival in chennai this year - for best director, best performance and play of the day! multiple shows of the itsY bitsY series were performed as part of the live in august theatre festival in chennai, during the whole month of august 2012 at the goethe institute, alliance francaise and spaces, at the world theatre day celebrations in chennai in 2012 and at the hindu lit for life festival in january 2013.
come discover live performance in your city!